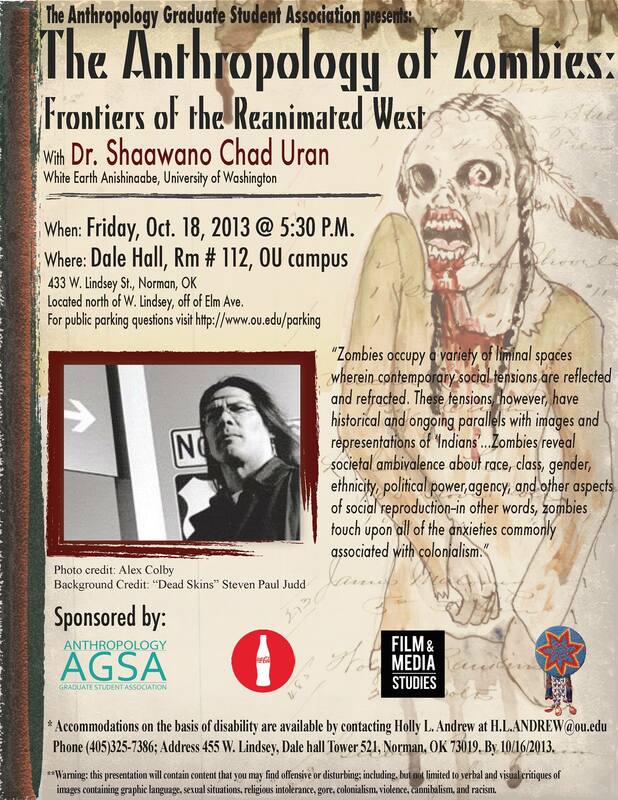 This is my public talk given for the Anthropology Graduate Student Association at the University of Oklahoma on October 18, 2013. Zombies occupy a variety of liminal spaces wherein contemporary social tensions are reflected and refracted. These tensions, however, have historical and ongoing parallels with images of "Indians." Zombies reveal societal ambivalence about race, class, gender, ethnicity, political power, agency, and other aspects of social reproduction. In other words, zombies touch upon all the anxieties commonly associated with colonialism. I had a great time at the University of Oklahoma for this talk! Thanks to Steven Paul Judd for permission to use his "Dead Skins" artwork for the flyer. Extra special thanks to the OU Anthropology Graduate Student Association and Royce Freeman for presenting me with an original Steven Paul Judd painting, his second zombie ledger art (the first was "Dead Skins").